This is truly a treasure. Have the ability to wear a rugged piece of jewelry, so customized that it has a completely unique marking of your loved on directly on it. 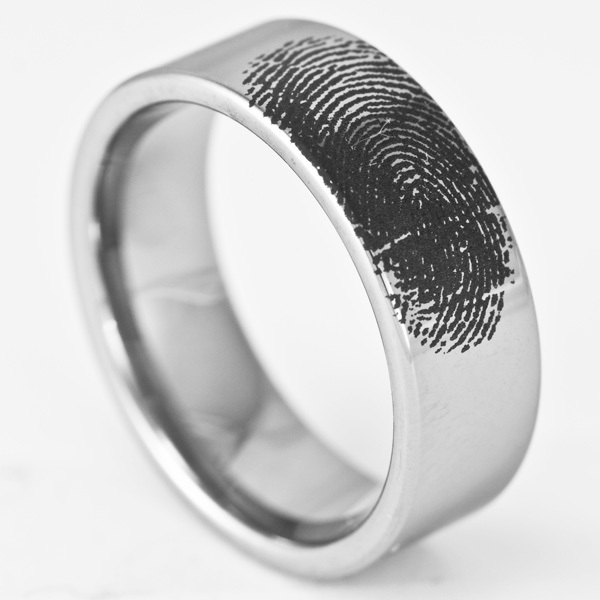 Whether it’s for your significant other, one of your children be it your own, niece, nephew, etc, or even if it’s a remembrance ring of someone who isn’t with you anymore – a Tungsten Fingerprint Ring is truly a great way to remember your loved one while they aren’t present. These can also be ordered with more than one print. For $20 each additional print, you could comfortably fit up to four prints on a larger tungsten ring. This particular model is available from Ring Ninja. They state they can do this type of engraving on other rings as well, not just tungsten. They have the ability to put your cherished ones fingerprint on not only Tungsten, but Cobalt, Titanium, and Stainless Steel as well. They even can do a white print on a black tungsten ring. We saw a few examples but they didn’t have any pictures for us to put up with this post. We hope to be able to add some soon as they really were some great, unique pieces of jewelry in the black. The cost of the men’s version of this ring is currently just $99.99. A lot of places sell this wedding band by itself for more than that – so this really is a great price. They make it easy to create your custom band as well. No need to ship out wax strips to take an imprint. All you need to do is create a clean fingerprint (for an example of that we suggest checking out their website) and take a good photo with a cell phone and send it in via email. They will let you know if the print is good or bad, and within a couple of days they will send you the completed ring! But wait, perhaps you aren’t 100% sure on your size? Well you can actually order the ring in the size you suspect you are – and they will ship it to you with no engraving. If you are in the USA and choose this option, they include a prepaid return shipper. You simply fill out the little form indicating if you need to change sizes, and slip the ring back into your US mail box. One nice thing about this option – if you are a little on the technically challenged side of things, you can put your paper prints in this mailer, and they will take it from there - no need to try and get them the image from your phone. This entry was posted on Thursday, June 19th, 2014 at 7:42 am. You can follow any responses to this entry through the RSS 2.0 feed. You can leave a response, or trackback from your own site.